Well I’ve gone and done it, dear readers…I’ve become a pyjama-dressing convert!! What brought on my change of opinion about this particular trend…yet another I said I’d never do?? Having been on the lookout for a new summer jumpsuit (possibly the easy-breeziest hot weather outfit option ever!) I started thinking about how much more versatile two separate pieces would surely be. Worn with the top tucked into the elastic-waisted bottoms, you’d be hard-pressed to guess that I wasn’t wearing a onesie. But I can also do the pj pants with a camisole top, for example; or the top with, say, a denim skirt…like I did today!! Cool outfit and great sandals! Whaaaaa!😂😂😂😂 And why don t we see pictures of that outfit??? I would love to, because of anyone van make a pyama stylish it s you! That is hilarious. All dressed up in your pajamas. Love it. I never would have known that wasn't a regular blouse if you hadn't said anything. It's really pretty. It looks great with the skirt. Love the skirt and the pj top. Please show us the whole set someday soon! 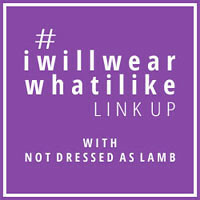 Thanks for linking up to the Top of the World Style linkup party. Great styling. The hat is the icing on the cake in this look! I love it! Haha .. adore you, Monika! And now I have to try the PJ trend! Too bad you don't live closer and we could do a girly pajama party! :D.